The action in Mystery of Longwei takes place at a mountain monastery, an isolated spot that shown sitting on the edge of a big cliff. 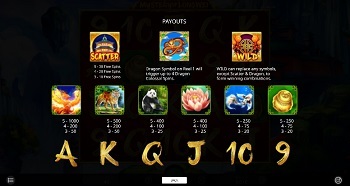 It’s a Chinese themed game, the way many are these days, and it’s been expertly designed by iSoftBet. As it uses the legends of China in its design, there could be said that there are some fantasy elements as well, particularly when you see a huge rock hovering in the sky, and covered with vegetation as well. Some of the other symbols that you’re going to be using have images of a Phoenix Bird, of Panda bears, fish, lotus flowers, gold urns, tigers with riding gear on their backs, dragons and temples. I’ve found iSoftBet to be an excellent developer, and the graphics are among the things I always appreciate about their work. It’s true for Mystery of Longwei as well. Established in 2010, iSoftBet has quickly become a very appreciated developer. They’ve built up an impressive collection and they’re offering a mix of regular and branded titles, the latter using older franchises as their basis (Beverly Hills 90210, Rambo, 24). These days, you can find these slot machines at some of the major online casinos, a sign that players appreciate their work and want to play their slots. Hot Shots and Booster are two of their recent games, which I’d recommend. If you look at the bottom, to the right of the Spin button, you have a Coin Value option that you can use. It’s going to tell you what the Total Bet is, with 40 active lines and coins. You have just the coin value to change, with a range of $0.01 to $1 available for it. You get quite a few lines, 40 total, and the game area is bigger than normal as well (5×4 reels). It’s not a difficult or overly complex slot. A symbol with a Chinese design and a Wild logo in it, this is obviously the substitute that you get to use in the formation of new combinations. It has to appear in just the right spot, or you don’t get to use it. It’s also a replacement only for regular symbols. A Dragon symbol, something you tend to see quite often in Chinese themed games, will be something you see on reel 1. If it lands there, it triggers Dragon Colossal Spins. There are up to 4 rounds to go through, during which the middle three reels get huge 3×3 symbols. The Dragon symbols from reel 1 will move one position down each round and they act as mystery symbols. The feature ends once you get no more Dragons on the screen. Scattered Temples are giving you your free spins here, with 10 to 30 rounds obtained in exchange for 3 to 5 symbols. 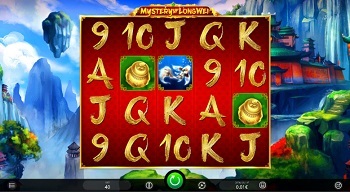 The free spins have their own colossal symbols, on the reels 2 to 5, and it’s the high-paying icons that get the honor. There is no option to retrigger free spins. Your individual wins pay up to $1,000. Since the game will often use Colossal Symbols during its free spins, the potential for big rewards is good and the high RTP is a natural conclusion. The Return to Player is at 97.01%, which is excellent for a slot. 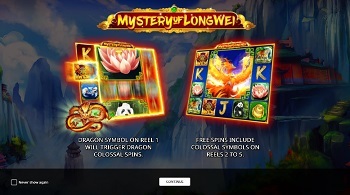 Mystery of Longwei can be a fun game to play, particularly if you want to stick with slots that have a higher RTP, to give yourself some better odds.